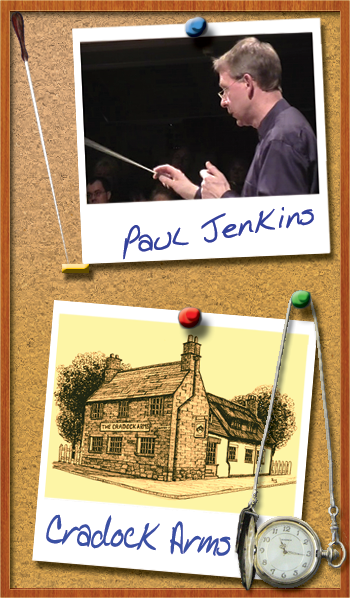 Paul Jenkins took up conducting in 2003 with a course given by Andrew Constantine. For several years Paul regularly attended the Canford conducting Course and took private lessons with Denise Ham, conducting tutor at the Royal Academy of Music. More recently Paul has been tutored by Toby Purser, Achim Holub and Robin O'Neal. In addition to conducting Knighton Chamber Orchestra and Knighton Opera, Paul is musical director of The Leicestershire Co-Operative Male Voice Choir and the University of Leicester Symphony Orchestra. In the summer of 2010 Paul attended the Graz Conducting Master Class given by Achim Holub in Austria. This involved rehearsing and conducting the Chamber Philharmonia Graz in the slow movement of the Bach E Major violin concerto with Tamsin Waley-Cohen as soloist, the first movement of Mozart Symphony No 40 and the slow movement of Schubert Symphony No 5. Some comments on the performances are given below. "Sie haben uns mit Ihrer ideenreichen Interpretation, dem rueksichtsvollen Blick aufs Orchester und nicht zuletzt mit Ihrer gefuehlvollen Bewegung entzueckt! Wir freuen uns schon auf das naechste Konzert mit Ihnen." "You have delighted us with your imaginative interpretation, the considerate view of the orchestra and, not least, with your soulful movement! We are looking forward to the next concert with you"
Mag.Toshie Shibata, concert master of the Chamber Philharmonia Graz, Austria. "Thank you for your beautiful conducting of the slow movement of the Bach E major violin concerto." Tamsin Waley-Cohen, soloist with the Chamber Philharmonia Graz, Austria.